It’s an unusually cool day in central Malawi, and the neutral-colored sky is threatening rain. 53-year-old Alikonde sits next to the small crackling fire she’s built underneath the overhang on the side of her home. Atop the fire sits a charred metal pot, and it’s quiet enough that all of us can hear the lid rattle as steam fights to escape from inside. The sweet, tangy smell of banana bread has just started to permeate the air. I check my watch again. It’s been exactly 42 minutes since the bread-making process began, but I have no idea how long it will take for the bread to finish. Only Alikonde knows. Our attention shifts to three chickens circling a mixing bowl on the ground in front of the house, attempting to steal away the scraps of banana peel. Selina, Alikonde’s oldest daughter, gets up to shoo the chickens away, but Alikonde smiles and motions to leave them be. As the chickens run off with their prizes, Alikonde looks out proudly toward the field beyond her house. Perhaps tired from the sunrise church service, she contentedly closes her eyes for a few minutes. Eight years ago, just before giving birth to her youngest daughter, Eliza, Alikonde lost her husband. The cause of his death? Unknown. Headache, illness and high fever. It could’ve been malaria, typhoid, yellow fever… it’s hard to say. With her two oldest daughters already married and gone, Alikonde was left to provide for two boys on her own. Back then, making bread was a means of survival. She’d learned the art of baking from her grandmother in 1999, when Samuel was born (that’s where she got the recipe for which she’s famous today — the perfect combination of maize flour, bananas, salt, soda and water). But the lack of clean water made it a slow process. Navigating the thick grass and banana trees to get down to the river took hours, and climbing back up the hill with forty pounds of water in tow took energy. For Alikonde, it meant one entire day had to be devoted to baking bread and the next to selling it. But it was still lucrative. Over the course of a year, Alikonde could profit about $80 selling her sweet loaves – far beyond the $30 the family was earning selling vegetables. Not having a husband presented challenges, but as the boys grew older, they began to help their mum more and more. They cultivated maize, millet and vegetables in the field and sold bread near the school. Together, the family of four was able to take care of themselves. Life was hard, but they were getting by. Then, in January 2018, life got a whole lot easier. With the help of Hope for a Child in partnerships with Rhema, the old broken borehole in Alikonde’s village was repaired. Suddenly, families weren’t limited to a single Jerry Can. Clean water was easier to collect and close enough that women could go as often as they wanted. Alikonde knew that the borehole would improve the health of her family and that collecting water would now be easier and safer. But better than that… she knew that this borehole meant business. Every bit of her bread-making process requires water: washing hands and bowls and utensils before and after, and to make the dough itself. ‘Without water it’s impossible to bake,’ she said. And then everything was possible. For the first time, Alikonde could bake as much bread as she wanted. As the process sped up, so did business. She began baking and selling 100–150 loaves in a single day, doubling her profit from $80 a year to more than $160. Today, Alikonde isn’t just providing for her family; she’s running a business. Instead of living day to day, she’s thinking about the future; it’s not about survival anymore — it’s about growth and opportunity. ‘I want to increase my productivity. To make more bread’. Alikonde explained how a bigger business would allow her to buy a larger field and even improve her home. She became animated as she talked about the goals she has set for herself: save money, hire an employee, increase production, sell to more customers. 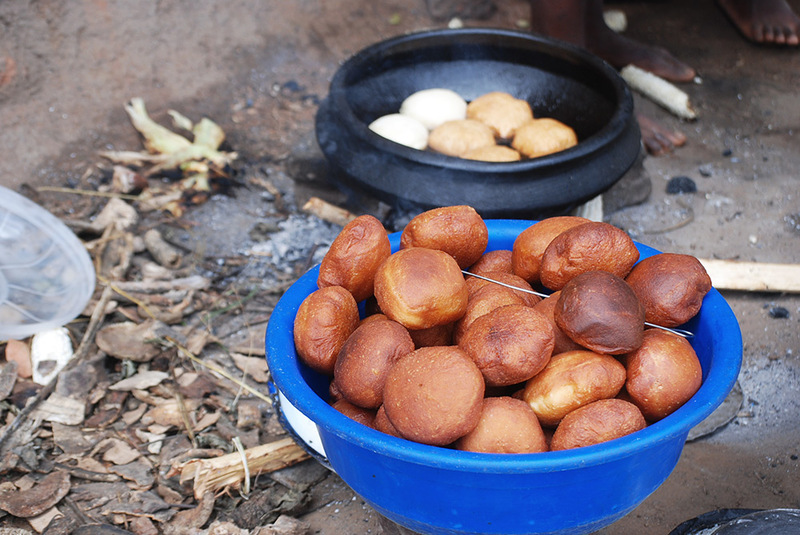 Alikonde brings the pot off the fire and moves to the table, where she carefully removes and unwraps the loaves one at a time — dipping her fingertips into cool water to keep them from burning. She collects the loaves, which appear slightly wet and have taken on little imprints from the banana leaves, and announces that it’s time to eat. I watch as two customers eagerly devour their bread, and then I bite into mine. It’s less banana-bready than I had expected. Maybe the maize flour skews the taste? I don’t know. But they’re perfect: dense and chewy, with sweetness balanced by delightful little chunks of salt that crunch as I chew. It was worth the wait. Alikonde shies away a bashful smile. ‘How do people react?’ I ask her. ‘It’s so delicious. Everyone must love it!’ Alikonde laughs, unsure of how to answer, and then looks back up at me. 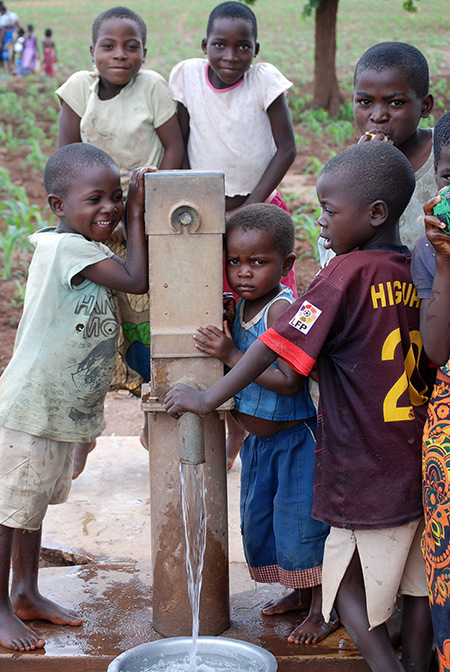 This is the difference that clean water makes. Alikonde isn’t just earning income for her family anymore, she’s building a better future. Water has given her the chance to dream and the means to make her dreams a reality.